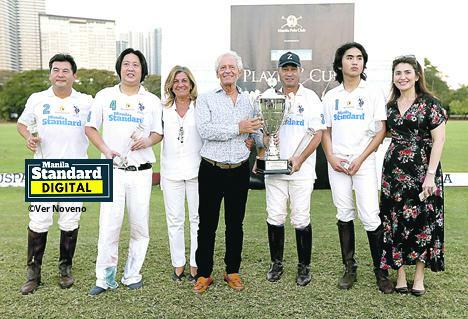 Argentine Ambassador to the Philippines Jose Nestor Ureta (center) is shown with wife Adriana Tomas de Ureta (3rd from left) and Leyte (1st District) Rep. and Tingog Party List 1st Nominee Yedda Marie K. Romualdez (right) as they hand over the Championship Trophy to the White Team Captain Manot Montilla (3rd from right) during the High Goal Players Cup of the Argentine Republic at the Enrique Zobel Field in Manila Polo Club, Makati City. They are joined by other White Team players Marty Romualdez (second from right), son of Rep. Yedda and Atty. Martin Romualdez, Jay De Jesus (left) and Alfie Araneta (2nd from left).